I’ve been meaning to write about this for a long time. I touched upon it briefly a couple of years ago, but there’s a fuller story to be told. It involves a time warp, a lost theatre, a boardroom fight and some ice cream. Let’s start with the event that brought it all back. Here’s a dumb thing to do; arrange to have theatre tickets on the day you’ve just arrived from a long sleepless night flight. The show was under-attended for a first night, but I was kept awake by the sheer peculiarity of the production. 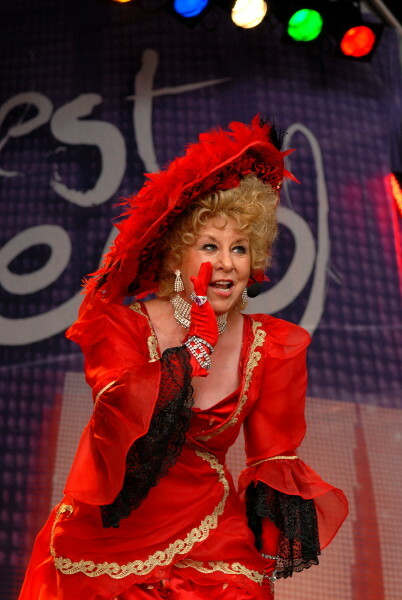 ‘Dear World’ is based on ‘The Madwoman Of Chaillot’ and stars Broadway legend Betty Buckley as the dotty Countess who ends up locking four oil barons in the sewers beneath Paris. The show had failed in its first incarnation decades ago. Perhaps the idea of turning the Tour Eiffel into an oil derrick was just too big a leap for audiences then. It may well be again. In the new production questions abound. Why are there so many people crammed onto the stage? Why is there so much scenery? Who thought it was time to bring back satirical whimsy? How does Ms Buckley’s elaborate outfit not get caught up every night? Will anyone actually fall into the orchestra pit before the end of the run? How much did I want to punch the wide-eyed French mime who popped up every time an accordion appeared? Perhaps there’s a place for a fable about mad old dears saving the world on the London stage – why not? But what interested me most was the venue. The Charing Cross Theatre is, indeed, in Charing Cross, or rather, underneath the station in a railway arch. Too large to be called a fringe venue, yet not quite big enough to really be included as a mainstream theatre, it wasn’t always here. What was here, was The Players’ Theatre. Or rather, it wasn’t. Allow me to explain. On the top floor of number 43 Kings Street Covent Garden was Evan’s Music and Supper Rooms, which opened in the 1840s and ran a late night variety show called Evans’ Late Joys, named after its owner Mr Joy. It preceded the invention of the music hall, and its shows were a huge success. Eventually the rooms closed in 1880. Then in 1936 two enterprising chaps decided to re-install the theatre and founded The Players’. It became a microcosm of British theatrical history, and many legendary names appeared on its stage. At its conception the Players’ was intended as a club, covering many aspects of theatrical entertainment. It was co-founded by Leonard Sachs, who older readers may remember as the tongue-twisting, gavel-wielding compere of ‘The Good Old Days’ TV series, which was filmed there. Sachs and his partner established the Players’ as a notable ‘little theatre’. In 1937, looking for a Christmas show, they were persuaded to present an evening of music hall entertainment recreating as far as possible a night at Evans’ Late Joys. This programme of early Victorian delights was an instant success, but Sachs’s business partner shortly died of TB at the age of 34. The Late Joys was a play on the original premises name as the shows began late (around 11.00 p.m.) mainly because they allowed both members and performers, of whom many were on the stage, to get there for the start after their own performances. The Players’ was recognised by public and critics as ‘The most original entertainment in London’. It was endorsed as one of the few clubs to which the subalterns of the Household Brigade were permitted to belong. The Churchill family were great supporters, with Sarah Churchill helping as a programme seller. Sir Maurice and Lady Violet Bonham-Carter were early adopters, as well as many leading members of London society. The theatre flourished, offering performances every night at 11.00 p.m. and at 2.00 a.m. on at least two evenings a week. During the war it had to be shut because there was a glass roof that would not have protected the audience. So The Players’ Theatre moved to El Morocco nightclub in Albermarle Street. This was in a basement in one of the few concrete buildings in London. Thanks to this the Players’, along with The Windmill, never closed throughout the War, and became a haven for Londoners suffering the Blitz, as well as a home from home for many of the allied forces living in London. Every Players’ audience usually contained a number of overseas visitors who were greeted and teased. Itinerant again, the Player’s Theatre roamed London without a home, sometimes turning up to perform in members’ sitting rooms, or at old military clubs. It seems nothing could keep the company down. When the owners looked for a new permanent venue they discovered an old music hall boarded up under Charing Cross station. This had been Gatti’s Music Hall in 1910 (I live next door to Gatti’s Wharf, where the Gatti brothers brought ice to London in barges to make the first Italian ice cream in the city – there’s still an ice cave in the building’s basement.) The boarded-up entrance was torn down and lo – there was a complete theatre preserved inside. 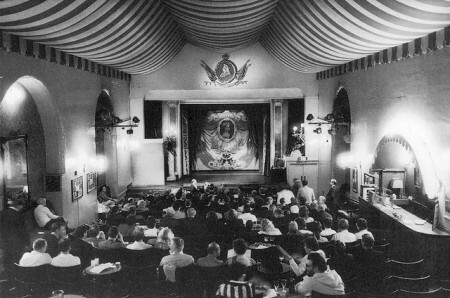 It had become the Forum Cinema after being a music hall, but was perfect. So The Player’s returned and opened once more. Once you walked through the doors of the Players’ you were in Victorian London. You could drink in the theatre, and were given song sheets to join in on all the old Victorian songs, and the comics made jokes about Mafeking and Victoria. After the war it became incredibly starry, with a virtual who’s who of performers appearing nightly. Sandy Wilson wrote ‘The Boy Friend’ for the venue, and the show became a smash. Maggie Smith, Clive Dunn, John le Mesurier, Hattie Jacques and many others appeared there. In 1986 the theatre had to leave its home because of the redevelopment of Charing Cross Station. Once again it found temporary venues that would host it. The club returned to another arch in Villiers Street that preserved the character of its previous home, and once again performers greeted the rumble of trains with the cry of “To hell with the London, Chatham and Dover Railway – sleepers awake!”. In 1996 Sir Peter Ustinov became the Honorary President. By now the club had members of the Royal Family attending, and staged Christmas pantomimes as well. The Players’ Theatre Club was unique and had survived unfunded and unsponsored since it was founded in 1936. Then disaster struck. In 2002 an unsuccessful takeover ruined the club’s relationship with its landlord. For a while there were two competing companies, but the New Players’ Theatre continued, only to collapse and become – the Charing Cross Theatre. A gem. This, Chris, is why we all love you. If you become any more imbued with the spirit of London, you will end up as a statue on Temple Bar. Anyone remember the silent film shows and cabarets at the Pindar of Wakefield? I remember a great old documentary that basically had James Mason wandering around late 60’s early 70’s London. I distinctly remember him covering this theater and there was even a clip of a performance featuring Barry Cryer. I am surprised Peter Ustinov was in involved though, as he he appeared to be involved in so many other things at the time? He was even chancellor of Durham University then and it was he who handed me my undergraduate degree, fully resplendent in flowing ermine on a hot summers day. “The London That Nobody Knows” (1969)?, there are a few clips on YouTube. Out on DVD. (Got to run, “mime is money”). Funnily enough that has been suggested in the past. The best thing about London’s history is that it’s driven by unusual characters – the Players’ Theatre wouldn’t have survived for this long if someone forceful hadn’t been determined to keep it alive. Not to be pedantic, but wasn’t ‘The Good Old Days’ filmed at the City Varieties in Leeds? Then go for it. If the earlier posts on ‘fan’ driven content is anything to go by an audience awaits! The gauntlet has been thrown and there could be no worthier recipient? Not pedantry at all John but accuracy – it was filmed in both – and God it had a long run! How well I remember The Players. I was a member for about 10 years u nyil we left London in 1969 for the West Country. Your article has revived so many happy memories for me. Thank you!